NeuWrite West -- How might electrical signaling in bacteria inform neuroscience? 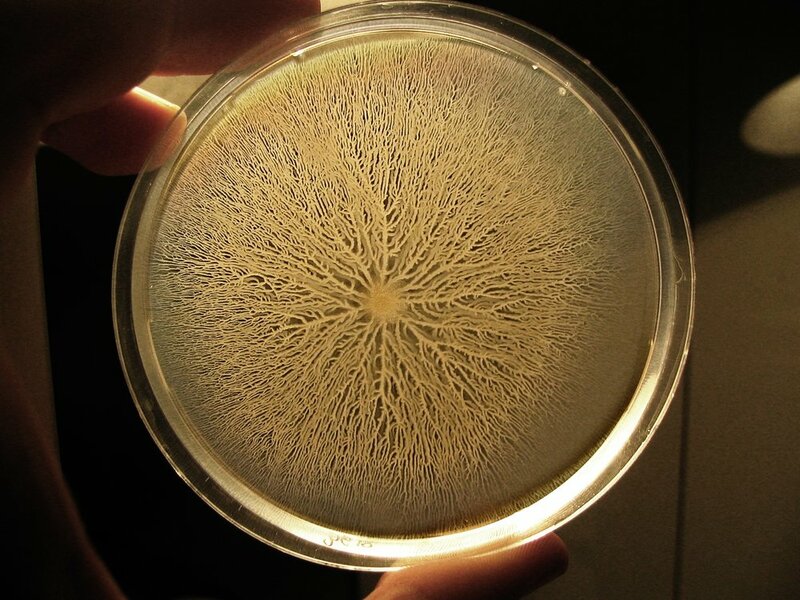 A swarm of Bacillus subtilis, whose electrical activity can force distant neighbors to join a biofilm. Image courtesy Wikimedia Commons. For years, scientists have known that bacteria living in communities known as biofilms can communicate with one another by passing chemical messages. Bacteria use this communication to help each other survive by coordinating their metabolism based on the amount of food available. Until recently, scientists believed that bacteria only communicated through secondary messengers. However, new evidence shows that biofilms can also communicate electrically using potassium ions, in a manner reminiscent of the human brain. This startling discovery shows that electrical transmission modulates activity between bacteria, a phenomenon traditionally thought to occur only in animal brains, and holds potential implications for both understanding how the nervous systems evolved as well as offers clues for unanswered questions in neuroscience. Electrical signaling in biofilms was first discovered by researchers in the lab of Gurol Suel. In their initial 2015 paper, Prindle et al. found that bacteria behave like neurons in that they release intracellular potassium in response to high extracellular levels of potassium, and that this wave of activity could transmit long distances. In 2016, the lab found that biofilms could actually communicate with other biofilms to align their respective metabolisms to timeshare scarce food. In 2017, the Suel lab published a shocking paper showing that this potassium signal could actually cross species, and recruit distant motile bacteria to join the biofilm . These findings unveil an ancient use of electrical communication that may give insight into how electrical signaling arose in animals. Additionally, these potassium waves show a striking similarity to the phenomenon of cortical spreading depression, a potentially serious event unrelated to clinical depression in which neurons progressively dump potassium in response to rising potassium levels, followed by the silencing of activity. These results may also suggest a mechanism by which cells in the brain can be attracted across long distances during development or maintenance. The future seems promising for the cross-pollination of ideas between microbiology and neuroscience. Humphries, Jacqueline, et al. "Species-independent attraction to biofilms through electrical signaling." Cell 168.1 (2017): 200-209.